Cooking on a bakestone or griddle has been common practice throughout Wales for centuries. 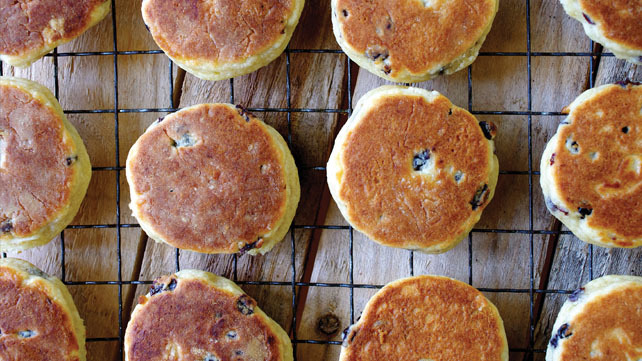 The art of a good Welsh cake is to cook them quickly on both sides so that they stay moist in the centre, but take care not to burn them! 01 Sieve the flour, salt and spice into a mixing bowl. Rub in the fats until the mixture looks like fine breadcrumbs. 02 Add the sugar, lemon rind and dried fruit. Pour in the beaten egg and stir to make a rm Sieve the our, salt and spice into a mixing bowl. Rub in the fats until the mixture looks like ne breadcrumbs. dough. 03 On a oured board, roll or press the dough to approximately 5mm thick. Cut into discs with a 4-5cm cutter. Or cut into squares, you will not need to keep re-rolling if you use this shape. 04 Bake the Welsh cakes on a medium hot griddle, turning once, until golden brown on both sides but still a little soft in the middle. 05 Dust with caster sugar while still hot. If you do not have a griddle you could use a heavy base frying pan, lightly buttered.